It looks like AT&T's Cricket Wireless is about to start selling phones at Walmart stores. A Howard Forums member spotted a Cricket Moto E in their local Walmart for $50. That's news for a couple of reasons. For one, ever since AT&T acquired Cricket at the beginning of the year, "New Cricket" GSM phones have only been available from Cricket branded stores and the Cricket Website, never at Walmart or other "big box" stores. Secondly, Cricket has not publicly announced the Moto E and it's not available on their Website. The Cricket press site does have some press images of the Moto E tagged "Walmart" suggesting that the E may be a Walmart exclusive. The images don't seem to be linked to from any other page on the Cricket site. I think that they are in place for an upcoming announcement. Fifty dollars is a great price for the Moto E which lists for $129.99 on the Motorola site. Of course Cricket's version is SIM locked and the one direct from Moto is unlocked. I have no idea if the Cricket Moto E can be unlocked cheaply or at all. The Cricket Moto E is not available on the Walmart website yet. I think it's likely that the Walmart store put it on sale before they were supposed to. I wonder if the appearance of Cricket phones at Walmart means that Cricket phones will soon be available from other national retail chains like BestBuy, Radio Shack and Target or will they be a Walmart exclusive? Update 10/23: A HowardForums member spotted the Cricket Samsung Galaxy Express at a Buffalo, NY Walmart for $99.88, roughly half the current street price of the GoPhone version. $10 Cricket SIM cards have also been spotted in at least one Walmart. A story on Twice.com quotes a Cricket spokesperson as saying that Cricket is now available in about 1000 (out of a total of about 3800) Walmart stores nationwide. It's believed that most of the Walmarts carrying Cricket phones are in former Cricket CDMA markets. The Nokia is a better phone unless you actually want to use it. Compared to this Motoe, it runs hardly any apps, and more expensive also. But if you want to make phone calls and take pictures and nothing more (Hello, 2003! ), then the Nokia is better. Have either of you actually used Windows Phone 8 or 8.1? It's really quite capable and the built in apps including the browser, maps and navigation, mail and calendar are excellent. There are still some gaps in the app catalog but what's there is sufficient for many people. Apps are important to me. Windows Phone doesn't have the ones I need. It's pretty clear too that there is no need for Windows Phone. It's a marketing thing, trying to create a need... and if it were easy for Windows Phone owners to painlessly turn their phones into Android devices, there would be few devices left running Windows Phone at all. Sort of like Mello Yello, which only exists because of Coke products only contracts preventing places from selling Mountain Dew. Actually, I used Windows 8 on the PC. It was so terrible that I had to right away find a utility that buried as much as possible of the Metro-type interface in order to make it usable. Based on the extremely (and famously) user-hostile experience of Windows 8 on the PC, I am very reluctant to use anything with this name. "As we’ve observed in the past, while Windows Phone is a very nice operating system, Microsoft hasn’t really given people a reason to use it other than saying it’s an alternative to iOS and Android. Microsoft can flood the market with dirt-cheap Windows products all it wants but it might also want to think about giving more people a reason to buy into its ecosystem as well." There needs to be something better than "Windows Phone", which so far has only succeeded due to selling to ignorant people who don't care what is on their phone. Perhaps they can go in the direction of a completely secure, NSA-proof phone. Apple and Google would be caught flat-footed on that, and there would be room for Windows Phone to make headway. OK, so you admit you've never used Windows Phone... Windows 8 for PC is a fustercluck, but Windows Phone 8/8.1 is a completely different (and better) experience. The only people I know who criticize WP are those who have never actually used it. In contrast, people who have actually tried it seem to like it. Yes. it is true. Microsoft should not have used a toxic name for their product. However, the apps I need don't exist in Windows Phone, so aside from the toxic name repulsing me, that is the main reason it is a no-go for me. Mike, I've also been reading about how the Windows Phone is pretty well locked down, and rooting apparently is not available yet to get around arbitrary restrictions on customer ease-of-use. I think once rooting ("Windows Cracking?") becomes common on it, it might really take off. I myself learned how necessary rooting is after KitKat prevented me from saving,working with data on my own phone's Micro SD card. Some call this increased security. I call it a security downgrade, violation. It is like being able to open your back door with a key all along, and suddenly this right is taken away from you. Anyway, until then, the strengths of Windows phones are, from all reviews I have read, more like that of a well designed "feature phone", than an actual smart phone. Use WP on a Lumia 520 and love it. Way more apps than I'll ever want or need. Before you bash something it might be worth knowing something about it. I suppose from that you aren't demanding when it comes to apps. The ones I need simply do not exist in Windows Phone. I don't need to own one to find this out, as I can search to find out which apps are available. The best defense on this argument isn't to keep claiming that it's good to be able to hardly do anything, but instead to say that maybe in a few years WP will catch up with Android and iOS. I'm curious to know what apps you need that aren't available for a Windows phone? I'm considering getting a Windows phone but I hear conflicting information about whether apps are available. I require specialized VR environment apps that exist in IOS and Android, that I use a lot... but no Windows Phone presence. In specialized areas, you will find apps in Android and IOS, but likely nothing for WP. And in areas where there might be many apps in all systems (i.e. podcatchers), WP will still have far fewer options, and much less chance of finding one that is any good. IOS and Android each have at least three times as many apps as WP at this time. On top of this you have the intentional quirkiness of the WP design, based on the idea of trying to be different rather than trying to work well. Then there is the idea of "open source". Always makes great sense, right? Android is closest to "open source", which makes it objectively better in ways than Apple and IOS, which is a focus on the whims of a few guys in offices as opposed to the actual needs of users. One reviewer of WP said "it just works", which is usually a code for it does just a few things. But don't think outside the box or you will find it won't work as well.. Android and IOS at this time don't just work: they work... and play, and sing, and dance. It certainly sounds like you have a legitimate need for a small set of highly specialized apps. For the other 99% of the population, Windows Phone is a great option. Seems like the same supposed 99% that would be happy with feature phones and not smartphones. But the proportion who want to be straitjacketed into doing very little is probably really much smaller than 99%. And why not have the flexibility to do just about anything you want, which is much more there with Android and IOS right now? Anecdotally, I know of a very "simple" user without these extensive specialized needs who used Android for a long time. Then she got a new phone, and found out it was Windows Phone. She found it hard to use, and could not wait to get back to the Android phone. Thinking of buying an S3. but if the 'Toe is good enough for half the price, I'd do that. I have both the 640 and 640 XL but I'm going back to Android after frustratingly trying to adjust to Windows. I have not even downloaded a single third party app, Even with Android I only had a half dozen third party apps on my phones. The thing is, I use speech-to-text" ALL THE TIME for texting, note taking, web browsing etc. And with Windows the feature is not nearly was well implemented, I means even my $30 LG Fuel was light years ahead in it's speech-to-text functionality and ease use. Also it often takes too many taps in Windows to do simple things and the lack of short cut/one-tap-widget type options for the home screen stinks. I do like the overall clean layout and look of Windows much better than Android, but it's just not nearly as seamless and polished. 'Toe Anon: I now have a Moto E and I use it alongside my Galaxy S5. The 'Toe comes across as no slouch. I won't trust it for photos compared to the S5, but the performance and other aspects of the device are real good. 640 Anon: The Windows Phone world is rudimentary compared to Android and iOS: far fewer apps in it, out of date versions, and lack of such basic features as you describe. By the way, there was an announcement several weeks back about "Gamestop" becoming Cricket stores. I keep calling Gamestop, and they know little or nothing about it. Interesting given the fact that all the PR last month in sept said the Cricket/Gamestop rollout would be complete by the end of October. Today is the 20th and still nothing. Thanks for that clarification. I THOUGHT it was supposed by done by the end of October, but was not sure. Checking the Gamestop web site, the only Cricket they have anything at all to do with is Zapper. I think the new Cricket is bungling this..... Makes me less likely to switch. I posted on HOFO Cricket is in one of my local Gamestop stores (out of 4). Western NC. This would be a departure from Cricket's current methodology of selling phones. On the website, you cannot buy a phone without a plan. Given the $50 price, it appears that the Walmart phone will be phone only, no plan. I doubt it was supposed to go live before the announcement, but it may have been left up for the end of the Moto E sales embargo. You can buy a phone without a plan if you have a Cricket account. You can buy a phone without a plan if you have a cricket account, but they force you to top up one more month when you buy it. 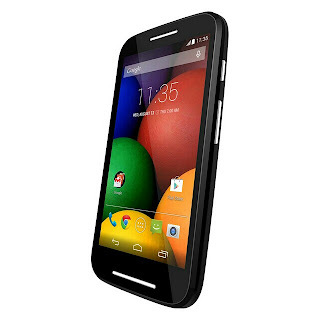 Is the Moto E or Moto G available from AT&T Gophone? No but you can use the unlocked versions available from Motorola or Amazon. Could the Cricket-Gamestop deal have been canceled? And replaced with Cricket at Walmart? I hope so. Id much rather go to Walmart than Gamestop. and if it is cancelled, it means we will be able to get plans/etc at Walmart. It would get rid of one of the problems (the not ready for prime time, hardly existing Cricket dealer network) that makes me hold back from embracing Cricket whole hog, and becoming, as one Cricket detractor put it, a "bug head". The Cricket Gamestop partnership may not have been cancelled. I think the two companies probably signed a deal and immediately announced it at the big CTIA tradeshow for maximum visibility. Then they started to work out the details which always take longer than expected. The Cricket S4 on Walmart.com is probably the old CDMA version. Gamestop is a lot more accessible to more people than Walmart, I believe. Major cities don't have Walmarts but they have Gamestops all over the place. I assume Gamestops are also in areas where Walmarts are located. You are right. There are a lot more Gamestops! However, there is the matter of basic costumer service. Compared to Walmarts, Gamestops are hardly open at all. The ones I know open late, and close early.... presenting customers with unfriendly locked doors, at times when Walmarts are open for business. 6600 Gamestops, 11,000 Wal-marts... Hmmm. Did you honestly just write "Major cities don't have Walmarts"!?!?!? Do you live in some third world country? Sheesh! Checking on Chicago... they have a dozen or so Wal-Marts. The Frisco area? I saw 7 or so. Perhaps the person who said ""Major cities don't have Walmarts"" is the same one that said there were 11,000 in the US. That is, someone who is just making up stuff as they comment. I live in San Francisco. The nearest Walmart is in 27 miles away in San Leandro. That's an hour's drive at rush hour and 36 minutes without traffic. By public transit it takes 90 minutes. I don't shop there. Gamestop and Radio Shack are less than a mile from my home. Target and BestBuy are less than four miles. All counts of Wal-Mart have around 4,200 or so. Not sure how you are so off... are you counting Walgreens too??? There are actually around 11,000 Walmarts, but only about 4253 of them are in the U.S. There are more than 6,600 Gamestop stores. But that is a world-wide figure too. Gamestop also operates 210 AT&T branded stores and at least 37 Cricket branded stores. Only the US Walmarts are relevant at all when discussing Cricket and US MVNOs or pseudo MVNOs. Gamestop had about 4400 stores in the US early this year, a little more than Walmart. In April, they announced they were closing 130 stores. So overall, there are about the same number of Walmarts and Gamestop stores in the US. Walmart is also selling the Galaxy Express ($100) and sim cards ($10). I used the same service to successfully unlock a Cricket Moto G.
Are you able to upgrade the Android software or is it like a Straight Talk phone where what you have now is what you'll have forever? Cricket Wireless: New 4G LTE Nokia Lumia 635,its newest Windows 8.1 smartphone from Microsoft. Starts this Friday,November 7th in Cricket Wireless Stores and Online in CYAN (greenish/bluish) for $99.99 WITH activation. Don't waste $20. Buy the phone on Amazon for $80, as reported by Dennis in Sunday's deals. I have a lumia 630 with a micro sim, can I put that sim into a moto E and use that phone as my primary? As long as it's a Cricket SIM, yes. Starting December 7th, Cricket Wireless is changing their unlocking policy, you must now wait 6(six) months before you can ask to have your handset unlocked, WAS 4(four) months.The device has to be a Cricket device that has been designed for the Cricket Network and purchased from a Cricket or authorized Cricket Dealer. I am in a Cricket Group Save with 4 other people in rural Alaska. We are in the middle of nowhere, but miraculously, ATT put up a new 4G, soon to be LTE, tower, so we decided to go with an ATT MVNO. There are NO Cricket stores up here, but it I found it very easy to set up everyone in the plan. 4 of us have BYOD iPhones, with no problems, and 1 has the free Cricket branded Nokia Lumia 630, which he also loves and has no problems with. Two of us have the Pro Plan, 10GB high speed data for $40/mo., and 3 have the basic plan, 1 GB of data for $20/mo. Everyone pays me once every 6 mos., and I pay for the group with monthly autopay. Everything is running smoothly, and CS was good on the one time we needed an account reset. We were able to abandon our creaky landlines (long wires thru the woods), and expensive DSL. We love Cricket so far. (ST, OTOH, was a nightmare of nasty rude CS.) I guess everyone has different experiences. Sounds awesome. Do you still use dsl or how do you stream videos? Dennis, Does anyone (prepaid or postpaid) have this great pricing? I think maybe AT&T postpone does? $40 for 10 gig Lte! Wow. Probably don't allow tethering/hotspoting. 20 GIGs to share, up to 10 lines, $100 plus tax, for example. Merry Christmas (no offense intended). That is great news on tethering. I did a quick search and there are no other offer that are as good given the trade-offs of contracts and weaker networks. The $100 for 10 lines for sprint ends after 2015 & then they add $15. The Sprint offer includes voice and data roaming on Verizon and regional carriers. You will probably have to move to rural Alaska and give up LTE to use that MVNO. Moose hunting on one hand.... LTE on the other. A hard choice, that one. More like seeing Putin, snap a shot, and upload him riding a polar bear and upload via LTE. That's just like Pooty-poot. While we focus on Keystone and Ebola, he reclaims Alaska for the Russians. Anon, where is this ATT Postpaid $40 for 10g LTE ?? No where. The point was made in response to the cricket plan & with a group, $40 for 10 gb is an option.